I wanted to show you this dress since I made it for the CSF fair in Paris last month. I teamed up with Henry Henriette, a pretty fabric and notions store in Nantes (they also sell online: here) as we shared our booth and we were all wearing Pauline Alice x Henry Henriette outfits. 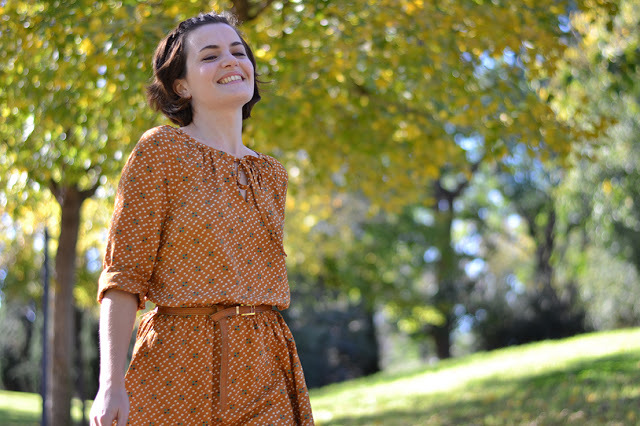 I made this Eliana dress in a soft rayon fabric, perfect for fall. The fabric drapes so nicely, I love walking in this dress as the skirt moves so beautifully. For the rest, I followed the instructions: bias binding for the neckline, elastic for the waist, pockets. I love the bohemian vibe of this maxi Eliana. It' s amazing!! You look free and happy!!! Oh my! This dress is sublime and the fabric, amazing! I secretly love long dresses because I know it's not my style, but this one makes me want to grab my pattern and run to the fabric store. Really, it's beautiful! Beautiful! Can't believe I've never thought of making it a maxi. I've made myself two versions and a friend tried mine on and demanded one of her own. All are especially luscious! Love this pattern. I'm so glad you like the pattern! Are you going to try the maxi version? wonderful dress ! just the sort of inspiration I needed to make a maxi. Superbe !!!! Fan des jupes et robes longues ta version me fait de l’œil !!! Merci, je suis ravie que ça te plaise! Really cute! and thks for bringing this pattern to my attention – I love maxi's. Thanks to you for liking it! What a stunning dress! Just fabulous! It looks wonderful! The rayon drapes beautifully and the colours work so well in this design too. Thanks Karen, I love this fabric! I'm not sure if this is the place to ask, but I'm making the Eliana dress for the first time, and would like to lengthen the skirt by a couple of inches (not to a maxi, but for more coverage). Where is the best place to slash the pattern piece to add the length? The sleeves include a lengthen/shorten line, but the skirt does not. It does look great as a maxi, though!